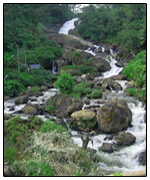 Attukal Waterfalls is located between Munnar and Pallivasal. It is a panoramic view but assumes a cascading and roaring beauty during the monsoons. It is one of the most attractive scenes that you can look at during your stay at Munnar. Attukal, 9 km away from Munnar, must be visited for its charming sceneries, glittering waterfalls and rolling hills is a feast for the eyes. The place is also ideal for long trekking and hiking but assumes a cascading and roaring beauty during the monsoons. 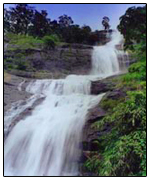 Thommankuthu is a small and beautiful, wild waterfall. 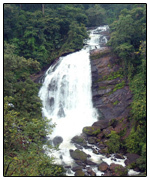 Thommankuthu waterfalls is a marvellous wonder of the nature situated 74 kms from Cochin. There are buses from Thodupuzha, which is 18 kms away from Thommankuthu. The place is ideal for nature overs and attracts thousands of tourists every year. The wild beauty of the scenic waterfall will steal the heart of any traveller. Thommankuthu is an ideal place for adventure tourism. About 10 kilometers (6 miles) from Munnar on the way to Rajamala, Nayamakad is a land of breathtaking waterfalls and an endless stretch of verdant greenery. Behold the spectacle of water tumbling onto a fern-fringed pool from a hill at a height of 1600 meters (5333 feet). Enjoy a peaceful mountain walk, stop along the way to take photographs and simply soak up the scenery. Take a walk up to the Nayamakad gap to take in brilliant views of the Munnar valley covered with a green carpet of tea plantations. The roar of this waterfall cascading down a steep rock about 2000 meters above sea level can be heard from a distance! 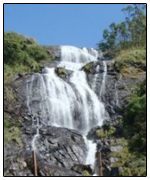 The thundering Power House Waterfalls is about 18 kms from Munnar, on the way to Thekkady. The verdant Western mountain ranges add to its scenic beauty, making it an ideal stopover on the way to Periyar Wildlife Sanctuary. The torrents of water plunging down Power House falls is said to emanate from Devikulam, a pastoral hill station few kilometers from Munnar. The waters of the fall are believed to have curative powers, and acts as a natural massage. 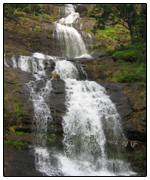 Situated in the beautiful district of Munnar, are the scenic Kuthumkal waterfalls. It is about 6 kms from Rajakkad. One of the prime destinations in Munnar, Kuthumkal falls attracts thousands of tourists every year. The misty waterfall provides a picturesque view of the water, cascading down from scintillating heights. It is a beautiful waterfall found in this district. Always, water mist is found near the falls because of the water falling on the rocks. The waterfall makes a lovely picnic spot and is an ideal place to spent a quality time with family and friends. The Cheeyappara Waterfalls is one of the beautiful waterfalls of evergreen Kerala and is a great eco-tourism destination of the region. It is one of the significant excursion points lying in the region surrounding Cochin. The famous Cheeyappara Waterfalls of Kerala are somewhere between Neriamangalam and Adimali along the highway linking Cochin and Madurai. 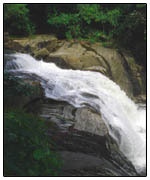 The Cheeyappara Waterfalls is one of Kerala's most magnificent waterfalls. You can see water cascading down here over seven steps. It is situated at an altitude of 1000 feet above sea level. 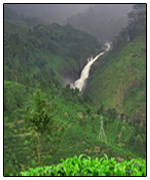 Located between Adimaly and Kothamangalam, at a distance of 42 kms from Munnar. Valara is a land of breathtaking waterfalls. Very beautiful down pour clear and chilly water from a peak amidst dense forest. The waters cascade down a hill from a height of about 1000 m. Valara Falls nose-dive into forested ravine below the road. Very impressive sight. Valara waterfalls are surrounded by lush, dense forests that are home to a wide variety of small animals and birds. The Thottiyar Hydro Electric Project, the upcoming project by Kerala State Electricity Board is very close to this waterfall.